In response to recent fatal police shootings, Mayor Rahm Emanuel has proposed to increase the number of Tasers in the Chicago Police Department. When Mayor Rahm Emanuel announced late last year that the Chicago Police Department would double the number of Tasers in its possession, stock prices jumped for Taser International, one of the biggest names in law enforcement technology. The company, which is cozy with former police chiefs and law enforcement officials, could make millions if it secures new contracts with the city’s Police Department. As leaders in Chicago and other cities face public pressure over high-profile officer-involved shootings, they are responding by ordering more body cameras and Tasers – electroshock weapons that supporters bill as non-lethal. Yet a rash of lawsuits and studies – and Taser-related deaths – raises questions about support for equipping more police officers with the device. Nonetheless, the Arizona-based company stands to benefit from the notion that Tasers can help curb excessive force. And it has a roster of former police officials to help it land contracts – part of a revolving door between law enforcement and the public safety industry. In Chicago, former police Supt. Terry Hillard recently has been lobbying on behalf of the company, city records show. Taser International is expected to supply Chicago with the 700 Tasers and 1,400 body cameras in Emanuel’s proposal. The company hasn’t received any orders so far this year and couldn’t provide an estimate of the value of the contracts. In 2010, Taser International reported $86.9 million in revenues. In 2014, the company earned almost twice as much, according to their latest annual report. “We think Taser is undervalued. We think they’ve got a lot of secular tailwinds behind them that should last for the next few years,” said J.P. Morgan analyst Mark Strouse, referring in part to the company’s boost from a new focus on police practices. When an elected official leaves office and resurfaces to lobby former colleagues on behalf of special interests like the energy sector or pharmaceutical industry, political observers and public watchdogs talk about the revolving door. The practice extends to former law enforcement officials, though they may not garner as much attention as former elected officials. Hillard, once the highest-ranking African-American police officer in the nation, retired from the Chicago force in 2003; he landed on Taser International’s payroll shortly after. A year after he retired, he partnered with a former chief of the Secret Service in Chicago to open a successful security and corporate investigations firm. The former superintendent has been a lobbyist for Taser International since at least 2006, state records show. Hillard couldn’t be reached for comment. 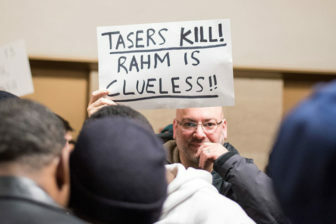 After Chicago bought its first order of Tasers in 2003, several lawsuits and studies alleged that the devices were not as non-lethal as claimed. The lawsuits slowed their use in law enforcement. The city wouldn’t drastically expand the use of Tasers until 2010, when it purchased about 400 of the devices with a federal grant. In 2012, the city made its biggest Taser purchase to date with a contract to replace 600 Tasers with new, upgraded devices. In 2011, while registered as a lobbyist for Taser International, Hillard was tapped by outgoing Mayor Richard M. Daley to serve as interim superintendent of police after Jody Weis left. That year, Taser International paid Hillard about $10,000 to lobby the Police Department, according to city records. Hillard served for several months before a newly elected Emanuel made Garry McCarthy his top cop. He resumed his lobbying work. 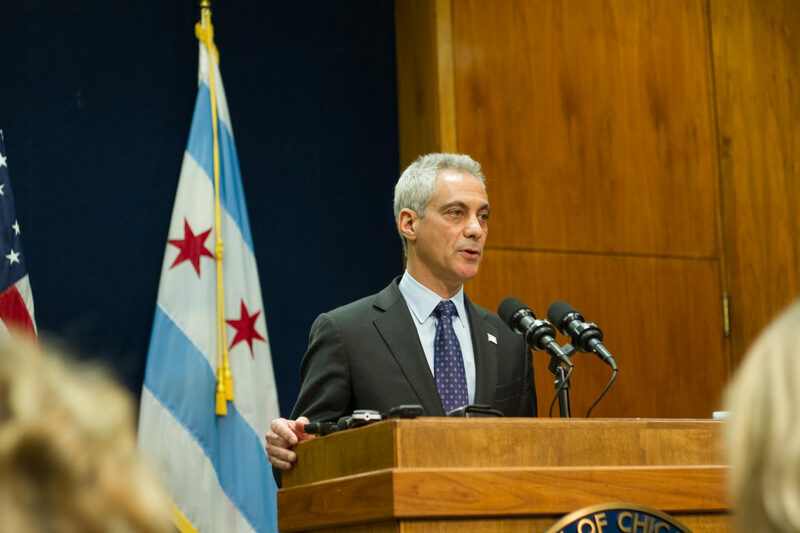 But in 2013, Emanuel appointed him to a committee tasked with selecting a new chief of the Independent Police Review Authority, the agency responsible for investigating the most serious cases of police misconduct. Hillard isn’t Taser International’s only link to Chicago police. Officer Jay Ryan, a Chicago police union trustee, works for Taser International as a part-time training instructor for Taser users. Political insiders at the state level have also worked with the company. The earliest state lobbying record for Taser International in 2005 lists John Wyma as a lobbyist for the company. Wyma was former Gov. Rod Blagojevich’s longtime friend and political advisor before he helped prosecutors send the former governor to jail. Liz Brown-Reeves, who worked on Illinois House Speaker Michael Madigan’s staff for nearly a decade, has been a Taser International lobbyist for years. Former Illinois House Republican chief of staff Matthew M. O’Shea was registered as a lobbyist for the company in 2015. Taser International boasts to investors that it maintains relationships with about 17,000 of the nation’s nearly 18,000 law enforcement agencies. People with former law enforcement or military experience are integral to the company’s sales strategy, according to federal disclosures and shareholder documents from Taser International. Sometimes the relationships have been accused of crossing the line into unethical territory. Police chiefs hired by the company were either working for police departments or had recently stepped down when they went on the company payroll. Authorities in Albuquerque have accused former police chief Ray Schultz of rigging a $2 million no-bid contract with Taser International months before he went to work for the company as a consultant. The company now bars hiring former law enforcement officials for one year after they leave their posts “in order to eliminate any perception of conflict of interest,” Steve Tuttle, a spokesperson for Taser International, told the Reporter in an email. Nothing like the two cases from New Mexico or Texas has surfaced in Chicago. Brune, of the Illinois Campaign for Political Reform, said the Police Department should still be conscious of appearances as it rebuilds the public’s faith in the department’s integrity. As taser deployment expands in Chicago, the Police Department’s loose standards invite abuse.